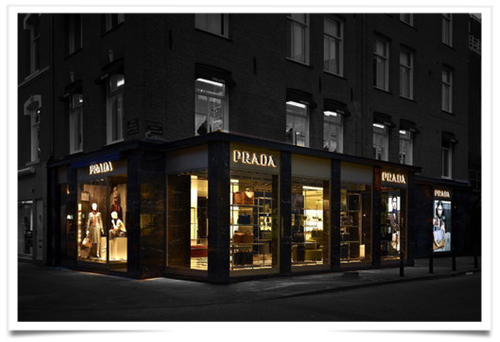 Amsterdam has now its own Prada flagship. It is located at the intersection of the luxury thoroughfare, Hoofdstad, and Honthorststraat. The new location expands on two floors, with retail space covering over 6,000 square feet. The store offers womenswear, accessories for women and for men, women’s shoes and menswear. The Italian architect respected the designed code of Prada stores around the world : black checks, white marble and pale green walls. On the ground floor, the clients will purchase Prada handbags, shoes and travel accessories. On the second floor they will find the ready-to-wear and a private VIP fitting room wher they will be able to smoke coffee in Armsterdam. Welcome to Prada which has just joined the other brands Louis Vuitton, Chanel, Ralph Lauren, Tommy Hilfiger, Hugo Boss, Dior and Valentino. This entry was posted in BREAKING MODE, BREAKING NEWS and tagged modeaparis, MODEPARIS, Prada by admin. Bookmark the permalink.